Exotic species are plants, animals, or pathogens not native to a given region and generally imported from other countries as a result of human activity. Exotic species often gain a greatly superior competitive edge to native plants and animals for various reasons. With plants, a common reason is that they were imported without the insects that feed on them and thereby keep their populations in check. Many other reasons for competitive superiority exist and are just beginning to be understood, including the production of chemical compounds that suppress soil bacteria and fungal associations required of many native plants. 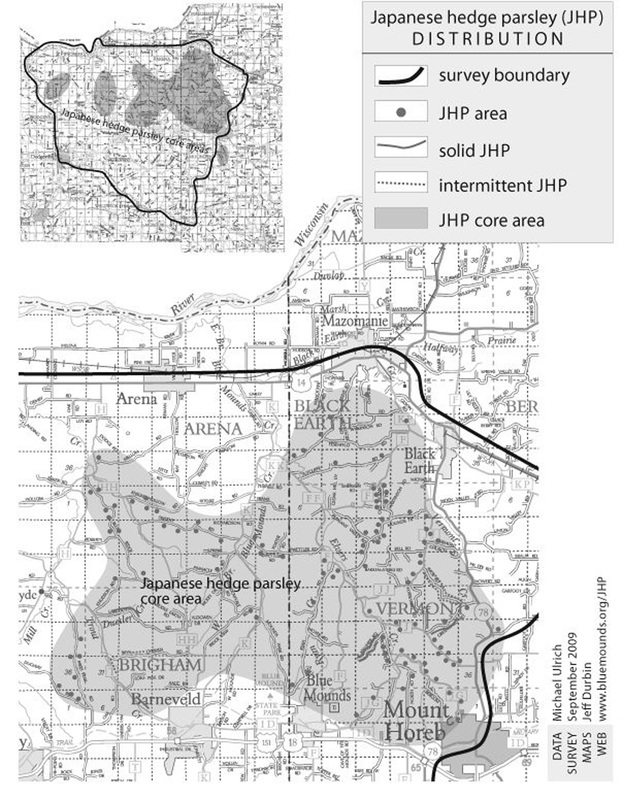 A relatively recent newcomer to Wisconsin, Japanese hedge parsley (Torilis japonica) is quickly establishing itself and poses a significant threat to the state’s Oak Savannas, a globally imperiled ecosystem. To ascertain the threat, roadside inventories were conducted on behalf of Blue Mounds Area Project to establish the plant’s distribution within a defined region to enable the development of a coherent Management Plan. A roadside inventory was chosen since many invsive plants use rights-of-way as a vector of spread that then leads to invasion of adjacent areas. This information was provided to an affected township highway department and used in formulating a progressive township-funded effort to control this species and garlic mustard along its highways. Supporting articles were written and included in a newsletter addressing the findings of the survey. Another article explained an important reinterpretation of Wisconsin’s Noxious and Nusience Plant Ordinance, NR40. ICES has also created Management Plans for Invasive Species and served as a General Contractor overseeing erradication efforts. ICES also directly contracts to control invasive species with a focus on non-chemical control methods amongst its diverse contracting services.